DETROIT -- New technologies in the race for lighter-weight vehicles dominated the 2016 Automotive News PACE Awards on Monday night. The annual awards for outstanding supplier innovations singled out seven new concepts that are helping automakers trim weight, ounce by ounce, to meet tougher expectations on fuel economy around the world. 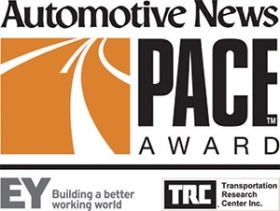 A total of 13 PACE Awards went to technologies across a wide range of vehicle components. Additionally, Audi, Ford and Honda won PACE Awards for collaborating with suppliers to deliver innovations. For full photo coverage of Monday night's event, click here. Those reviewing accolades include a new process from Faurecia Automotive Seating for giving textures and designs to seat covers while reducing the amount of material involved, and an electronic door latch developed by Magna Closures that eliminated several of the electrical parts previously required. The PACE Awards are an annual recognition of proven new ideas in design and technology that are shaping the auto industry. “Innovation needs commercial success for validation and competitive impact,” said J Ferron, PACE director of judging. “Otherwise it remains a nice science project.